Located just off Cavill Avenue on Orchard way you can find this simple honest little bistro. From the outset it appears neat and tidy, a good trade of people and no need to book just try a walk up, and we did this with a group of 9 people, a mix of adults and teenagers ranging from 14 to 48. 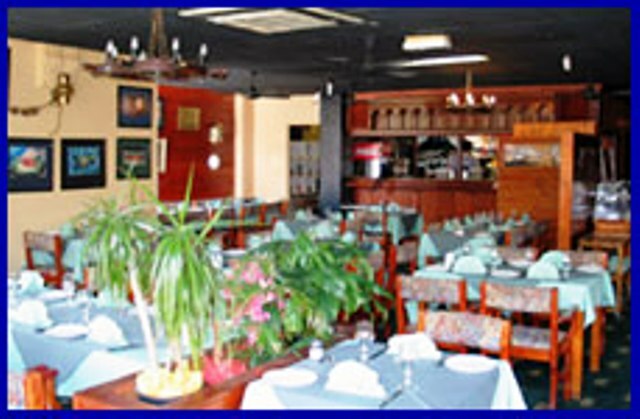 Our group had a couple of special requirements 1 vegetarian and one glutton free dinner, this will test many menus as we travel around Surfers Paradise. 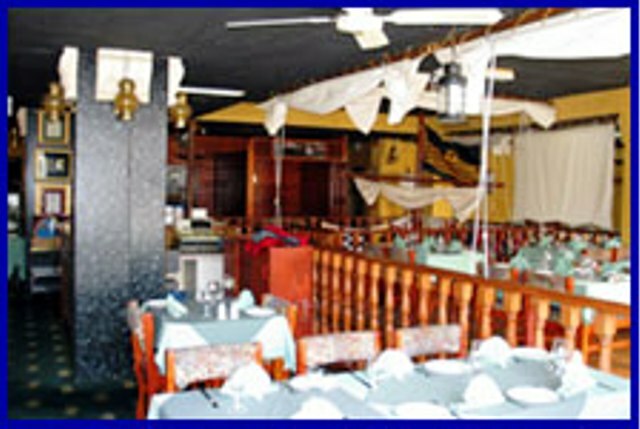 The menu is simple with a few eye-catching specials, as well as set out menu with entrée and mains easily read and understood. The prices well it is Surfers Paradise in the peak so they are not too bad quite comparable to many of the other establishments. 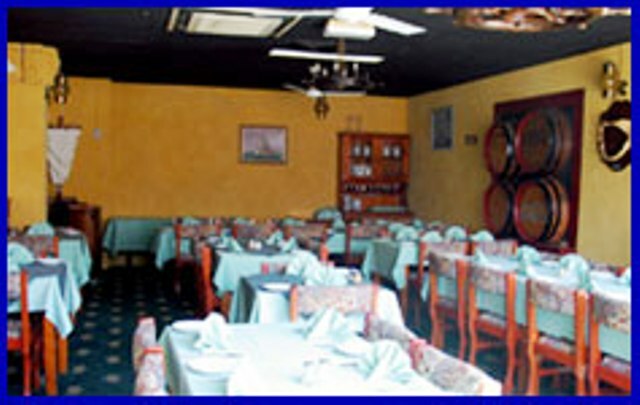 I would say a good meal for a family, business traveller or even a couple. 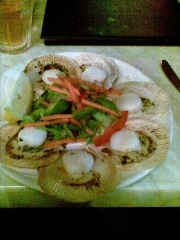 Seared scallops on the shell with simple burnt butter sauce and fresh garnish of Italian styled vegetables ($13.95). This was light and fresh the scallops seared on the shell topped with a herb and burnt butter sauce, scallops where small and slightly over cooked but a nice dish. 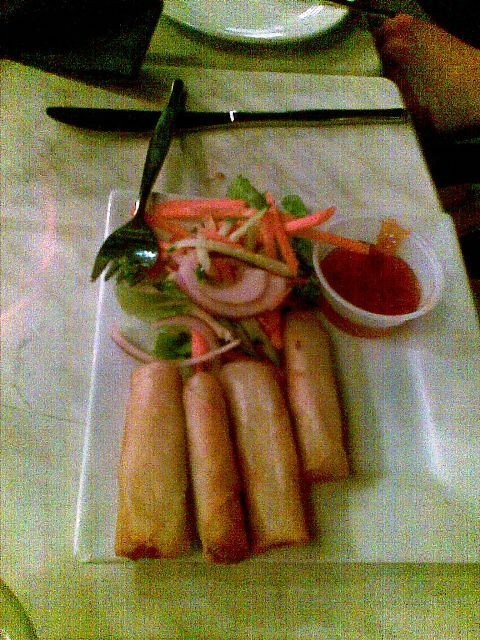 Vegetarian spring rolls with a sweet chilli dipping sauce ($6.95). As we expected fresh and crispy, the dipping sauce was quite spicy but overall a nice starter. Thirdly chicken satay skewers ($8.50). The serving was good and the flavour not too spicy would suite most eaters. Garlic prawn entre as a main ($12.50) is a classic dish for any restaurant, and the Captains Table did not disappoint. 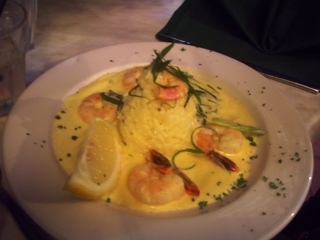 The dish is presented with the prawns in a light sauces and a cone mould of saffron rice. This dish was balanced and light on garlic, and oil a clean dish that does not repeat for many hours after. 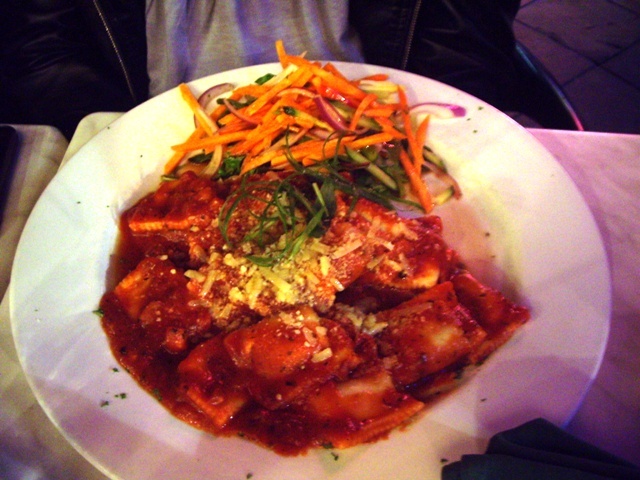 The vegetarian dish was a Spinach and Ricotta Ravioli, this comes dressed in a tomato sauce and julienned vegetables ($15.95). The flavours of oregano and garlic came through the dish, the pasta itself was flavoursome and cooked andante, not a bad choice for a vegetarian and even of you just like pasta. Then there was the Catch of the Day ($14.95). This was expected to be a great dish, freshly caught fish on the Gold Coast, but when asked the staff did not really know what the fish was in the dish. 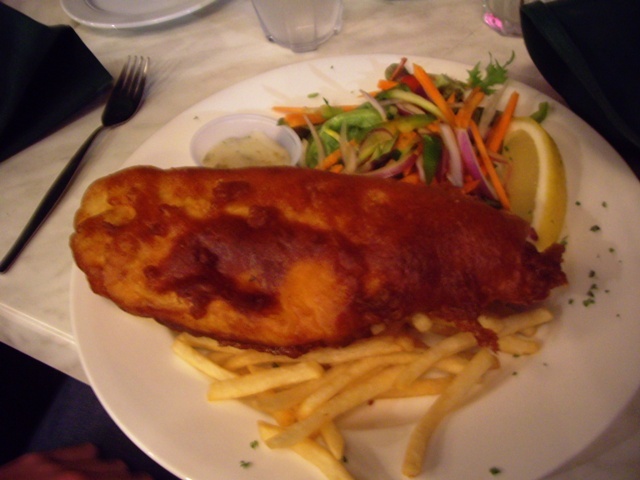 The fish came battered in what we think was a light beer batter, which unfortunately was well over cooked bordering upon burnt. I would have to say not the best dish of the dinner. 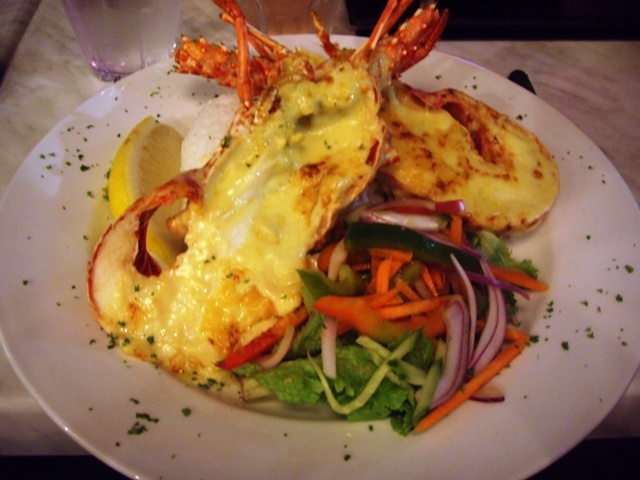 Since we are on the coast we looked and saw the whole Lobster Mornay (snap frozen onboard the ship when caught) ($45.00). This dish was good value the Mornay either had wasabi or horse radish in it, which added a bit of heat which I liked the meat was a little overcooked but I put that down to frozen seafood. Tasmanian Kangaroo ($25.95). 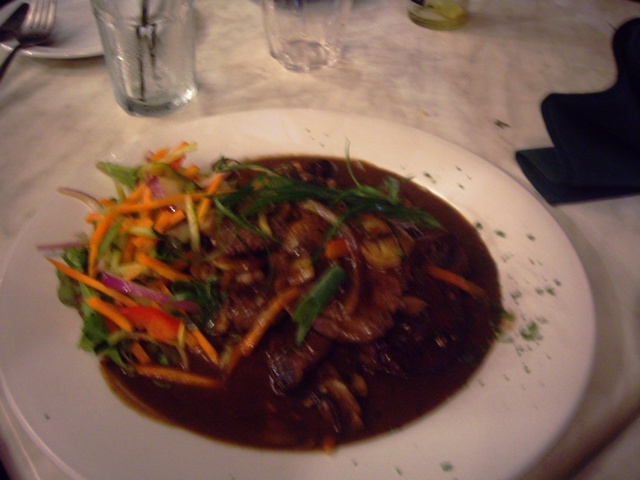 This came out swimming in a sauce, but the meal was well balanced and cooked to perfection, even one of our teenage dinners enjoyed the dish. The appearance did not do the dish justice. 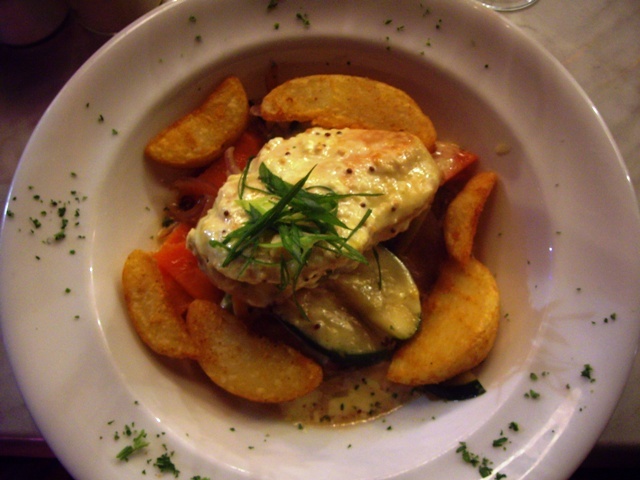 And now for the chicken dish, Camembert Chicken ($17.95). This dish was a real winner great value for money, nicely cooked chicken fillet with a camembert cheese sauce and filled with camembert and avocado. The dish presented well and tasted great, a real winner. 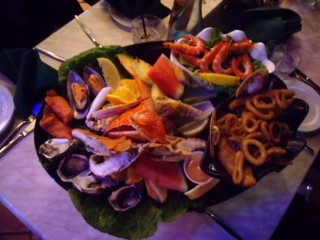 Now the contentious meal of the night the gluten free meal Seafood Platter for 2 ($75.00). When ordering we where very specific that this meal was to come with no wheat flour, breadcrumbs or other gluten products, but upon arrival all of the calamari and fried fish came out with breadcrumbs and had been served on top of the chips. The rest of the dish was great, good flavours and fresh. There where Morton Bay Bugs, Oysters, Mussels, Prawns and fresh fruit. This dish was a good size for 2 people and they enjoyed it. 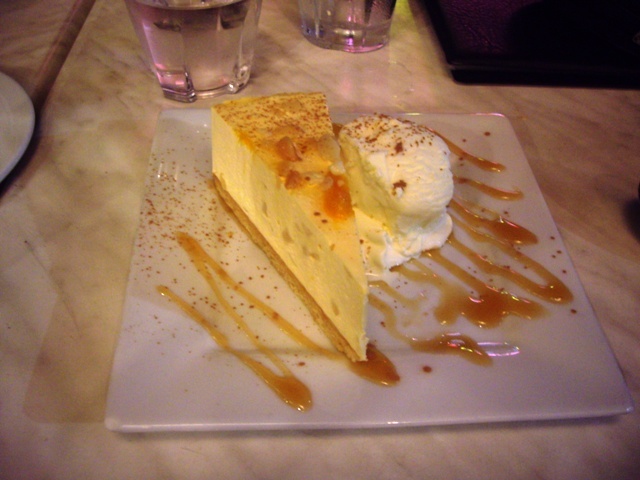 Just to try most things we also gave one of the deserts a try, the macadamia and mango cheesecake with ice-cream (shop bought ice-cream) the cheesecake was fantastic fresh and light what a great desert. All in all this was a restaurant that would suit most families or a couple, when on holiday this will be reasonable value they are located just off Cavill Avenue right in the centre of the action. Word of warning they are located just down from the adult entertainment clubs.